While in Michigan, Angel and I had the chance to visit my all-time favorite island: Bois Blanc, which is the lesser-known neighbor of Mackinac Island in Lake Huron. If you want to visit this gorgeous island, usually the best way is to find a cabin that offers short-term rentals for a week or weekend in the summer. We have family with a cabin on the island who offered theirs to us for a few days, which definitely helped lure us to stay. The typical way to get to the island is by riding the Kristen D., the ferry run by Plaunt Transportation. In the past, Angel and I have gone over with just bikes, since we were staying with relatives who already had brought a car to the island for getting around, but since we were going by ourselves this time, we brought a car over--it is a small island, but not small enough for navigation by foot and bicycle alone. 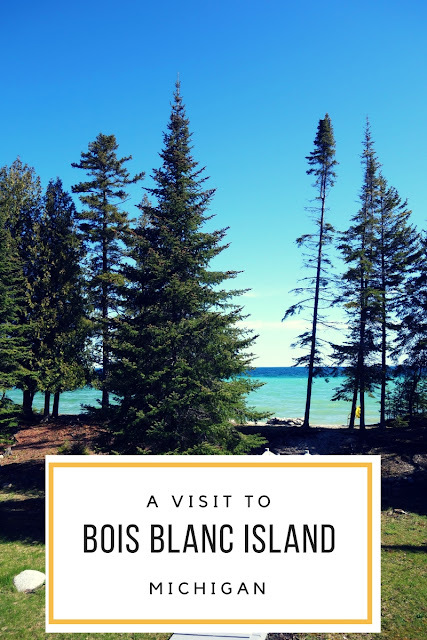 Now here's the real question: What is there to DO on Bois Blanc? Well, to be honest, not much. The general outdoorsy activities--hike, fish, kayak, hunt for cool rocks, sit around a bonfire at night. There's a few places of interest for sightseeing--places that seem like they haven't changed a bit in the nearly 20 years since I first visited BBI: a one-room schoolhouse, the airport, the cemetery, the cross near the North Shore. That's it. 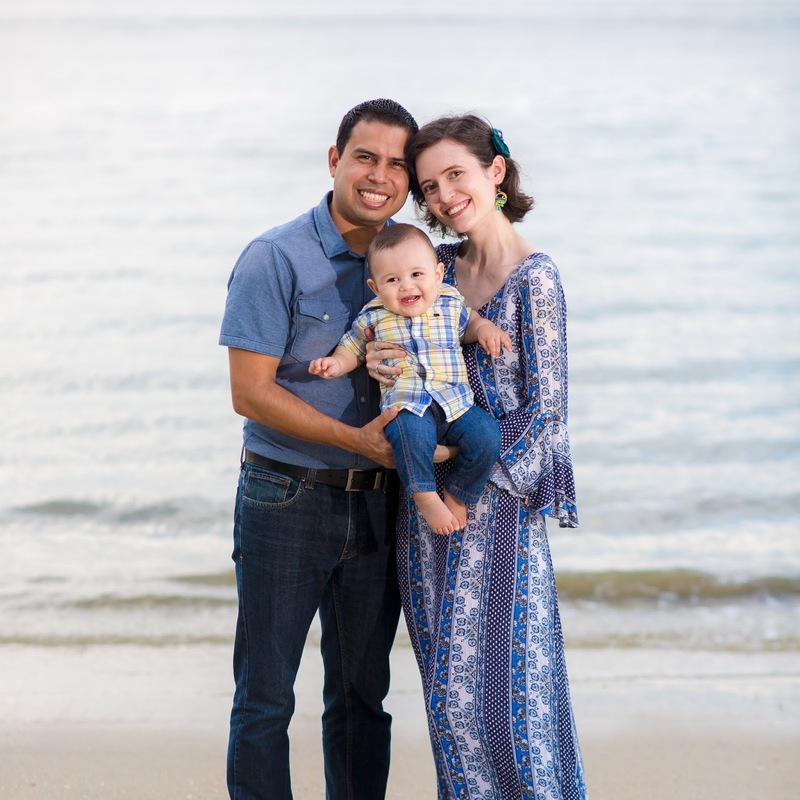 A place where "life takes unto itself a deeper, sweeter, larger meaning than ever before." I know that sounds like exaggeration, but in my experience, it's the simple truth. It's a place for real rest and healing. 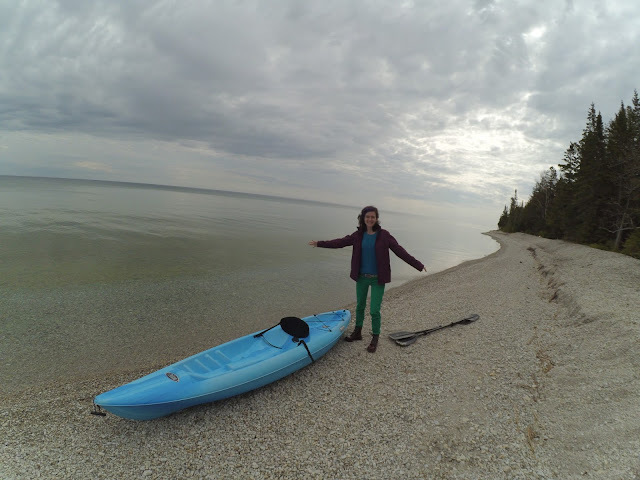 Bois Blanc Island was the only place I wanted to be last fall after the miscarriage of our first baby--instead, we got to spend a few days of the week that she would have been due on the island, and for that I'm so grateful. We had three nights and two full days. The first afternoon/evening we were there was sunny and we explored the cabin and the shoreline just a few steps from the back door. I took a "fashion blogger" photo showing off my borrowed cool-weather clothes. The Docs are not borrowed, they are back on their rightful owner's feet, although they currently live in Michigan since they aren't exactly the kind of shoes you want to wear in the tropics. Our first morning, the water of the big lake was as still as glass, so we got out two kayaks and went out paddling. It was perfection. 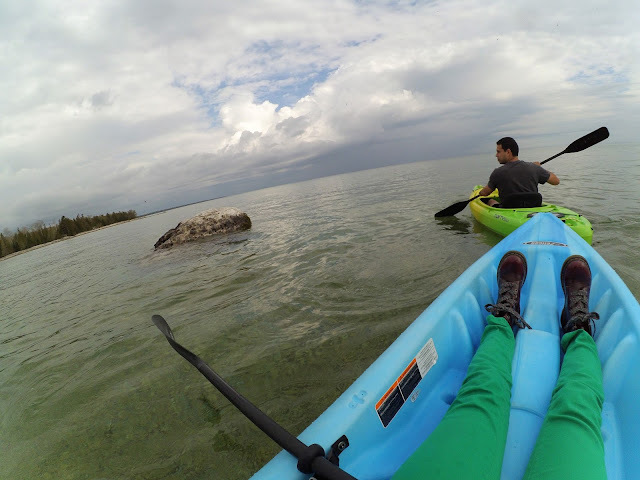 I got tired/lazy at one point so Angel tied my kayak to his out in the water and then paddled us both out to a large interesting rock that was sticking out of the lake some distance away. We whiled away a peaceful hour this way and eventually returned to shore. Angel had the job of stepping into the icy water to pull our kayaks in. This girl and these Doc Martens had no intentions of getting wet! By the time we brought in our kayaks, it had started to rain, so we stayed indoors for a bit and read before deciding to go out exploring. I drove--I haven't gotten a lot of driving experience while living overseas, but where better to put in some miles than on an island with few inhabitants, dirt roads, and a 25 mph speed limit? Now that's my kind of driving! 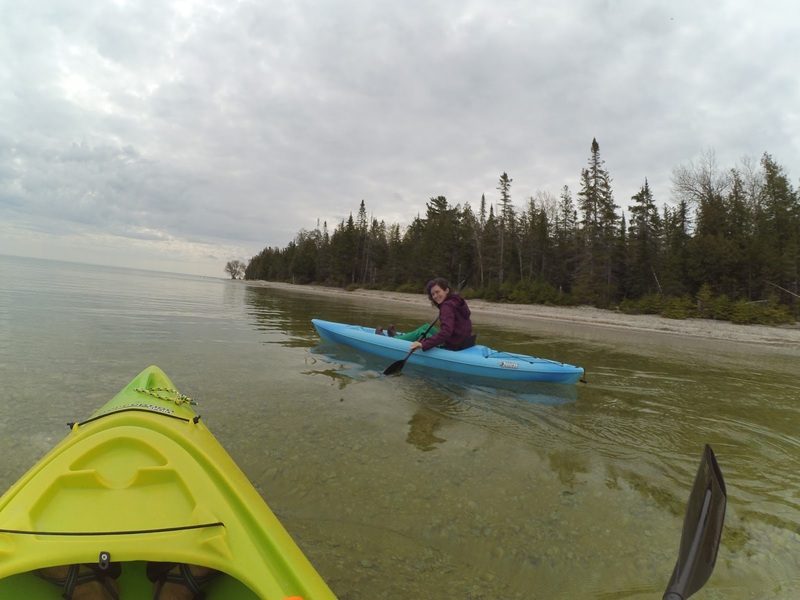 We headed to Snake Island, which is more of a peninsula than an actual island, to do a little exploring and rock hunting. Angel had decided he wanted to find a Petoskey stone, which I'm pretty sure don't exist on Bois Blanc Island, but that didn't stop him from looking! Afterwards we headed to visit the cross at the North Shore and look for more rocks, but it was getting colder and windier by then so we didn't stay long. We drove back to the cabin and enjoyed a peaceful evening eating warm soup, reading, and watching Netflix. After the first half of our trip to the US, this peaceful break was much needed! 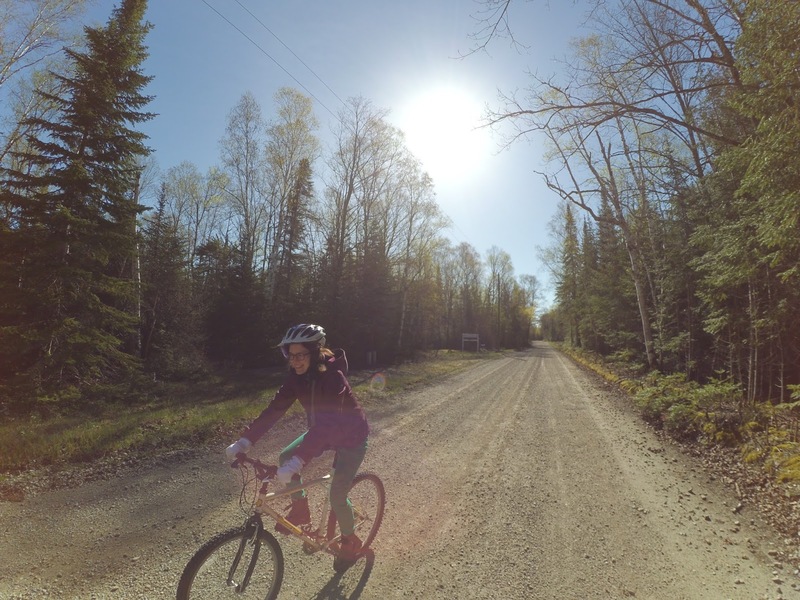 The next morning was sunny but chilly and we decided to go for a bike ride to Lake Mary, a small inland lake not too far from the cabin. It was so cold when we started riding that I wore socks on my hands to keep them a bit warmer (remember, we weren't very prepared for the weather of late spring in northern Michigan). The bike excursion was followed by more rock hunting, a lunch outing to share a burger at Hawk's Landing, the small restaurant/store on the island ("share a burger" means I eat the french fries and he eats the burger, ha!). The day passed in a perfection of being cuddled up in blankets reading books and wandering out to the lakeshore to enjoy the view in the evening. Once it got dark we were able to spot the light flashing from Lighthouse Point. BBI is the perfect place to stop and rest--to simply enjoy the beautiful world God made. It was good to spend just a few days there after 5 years without a visit, but I'm already longing to go back. Where's your favorite place on earth? Wow these pictures are beautiful! I'm so glad you were able to go there, especially that week. I've been to Mackinac Island and loved it. I'm such a city girl. I'm positive I would probably freak out at first when I don't see many people or activity going on. But I also love the outdoors. That Kayak and water looked so peaceful and quiet. Looks like a pretty wonderful place! I think my favorite place on Earth has got to be Yosemite! That looks like such a lovely place! I've always wanted to visit this area but have never had the opportunity. Wow, that looks lovely! And I love your colorful cold-weather duds! Loved this recap!! Looked like a blast!! What an awesome place. I imagine cellphone service isn't easy to get there, which makes it even more perfect. My favorite place on earth: Alligator Point, Fla., especially in winter. Your photos are so beautiful! It looks so peaceful too. I haven't ventured into Michigan too much, even though I currently live in Minnesota and I'm from Wisconsin. There are a bunch of places I'd like to visit, though, and now this is one! Looks gorgeous! My favorite place on earth is just in general any beach, but especially beaches in Florida, the Caribbean or Hawaii. This looks absolutely amazing! We went to Michigan last summer but I kind of want to plan another trip now just to see this! Ahhhh so jealous!! Wish we had islands like that here in PA! It looks incredible! One of my favourite places is Sooke on Vancouver Island. We lived on Vancouver Island for a few years while my husband finished his common law degree. If I had the chance to move back I'd be there in a heartbeat. Wow I'm loving these pictures! It looks like a wonderful place, I might just have to plan a visit!